On Saturday August 29th Southport travel to Barrow and you can save the hassle of driving in the Bank Holiday traffic by booking on the TIY coach. Prices are just £14 for members, £19 for non-members and £12 for juniors and you can book by calling or texting Colin on 07861 416859. The coach will pick up at The Arion at 11.10am, and then at The Crown & The George before departing the Merseyrail Community Stadium at 11.30am. Unfortunately the coach to Braintree will not be running due to a potential loss of £400. Alan Scarisbrick is no longer Chairman or on the Trust board. The board wishes to thank Alan for all the work he has done for the Trust over the years. The Trust's available funds currently stands at £31,031.72. The amount due for the floodlights project will be paid in instalments with the fist payment due to be made shortly. Bill reported that membership currently stands at 227. There have been 23 new members gained since January. Memberships will not be noted as lapsed too early as August is the main period for renewals and some supporters may be away on holiday for example and unable to renew for a couple of weeks. It was suggested that approaching people more at Trust events and explaining what the Trust was about may encourage more membership. The cricket match unfortunately had to be postponed due to adverse weather but the event will be arranged again for next year. Both the Trust and Churchtown Cricket Club would like to thank Richard Brodie for giving up his time and going to The Rookery to meet with supporters and members of the cricket club. 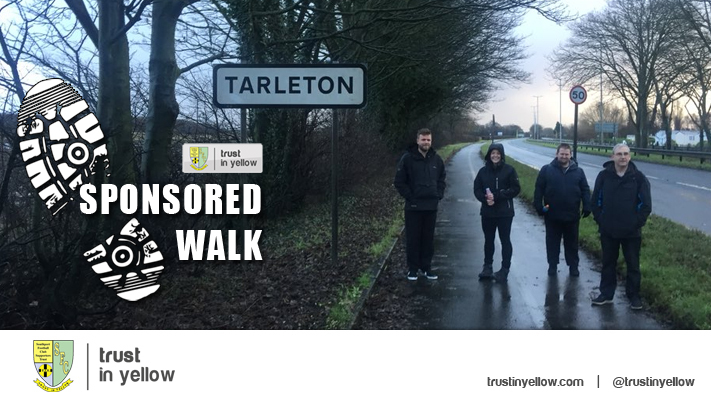 Churchtown CC have also challenged the Trust to a football match. The Reunion was a huge success and the feedback from supporters and the legends has been fantastic. Both the match and the event in the Grandstand Bar afterwards were extremely well attended and a DVD of the match is now on sale. It was a huge team effort but thanks must go in particular to Colin & Alan Jones for mastermining the event which has hugely increased the Trust's profile with supporters. The Meet the Manager session was broadcast live on Periscope, an app connected to Twitter, and was watched by 250 people. Thanks to both Paul Carden and Gary Finley for attending and also to Noel for hosting the event. The Quiz Night will take place on Saturday 5th September with a start time of around 5.30pm. There will be teams with a maximum of 6 people and entry will be £1 for each person. The 6 categories will be a picture round, general knowledge, sport, TV & film, music and Southport Football Club. The Race Night is confirmed for Saturday 10th October with race sponsorship, horses and jockeys going on sale soon. Sponsorship of a race is £25 whilst horses and jockeys are £3 and £2 respectively. Howard is liaising with Mark's family over the evening which will include a disco and a karaoke. The event will also aim to raise money for Marie Curie. Looking further ahead it was proposed that the Trust's Christmas Party in December could be a family event. 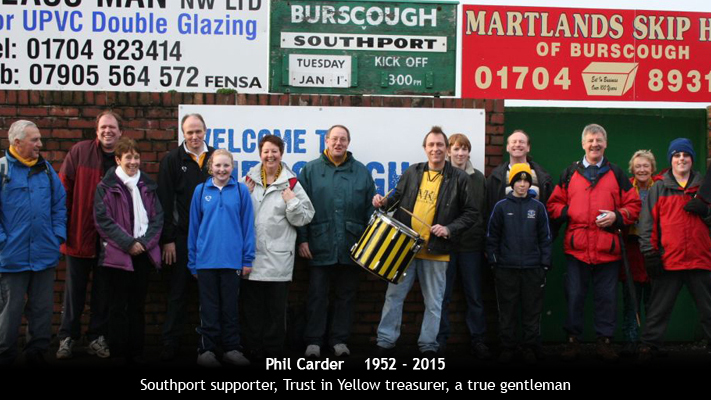 The Trust would like to thank the club for holding a minute’s silence prior to the AGM in memory of Phil Carder. The meeting with the club was a positive one and the Trust now has the invoices for the work on the floodlights which will be completed in time for the Tranmere game in September. With regards to the next project this will be put to members and it is possible that the Fans Fund Small Grants scheme could be used to help depending on the project. The coach to Macclesfield ran at close to full capacity and at a profit of £105. This will be used to ensure that the coach to Cheltenham also runs. 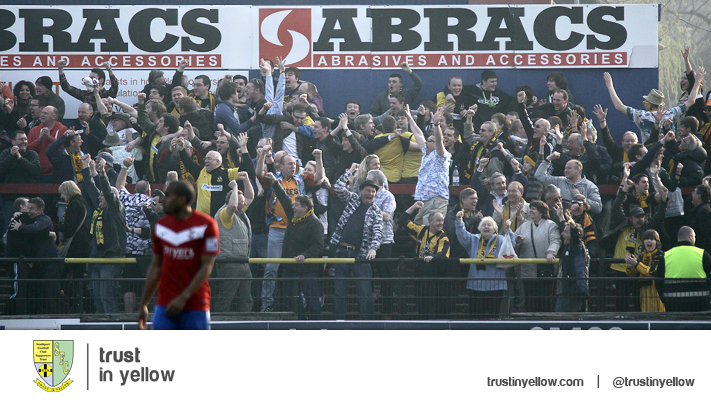 Positive feedback has been received about the improved pricing structure this season. It was suggested that the destination of this season's weekend trip could be put to a members' vote. The date of the AGM will be moved back to coincide with the installation of the floodlights. Martin, Alan and Andy are the Board members up for re-election this time. There are currently 3 seats available on the Trust Board and it was suggested that each person should have a specific title to add clarity to their position and also to make it easier to advertise for specific roles. 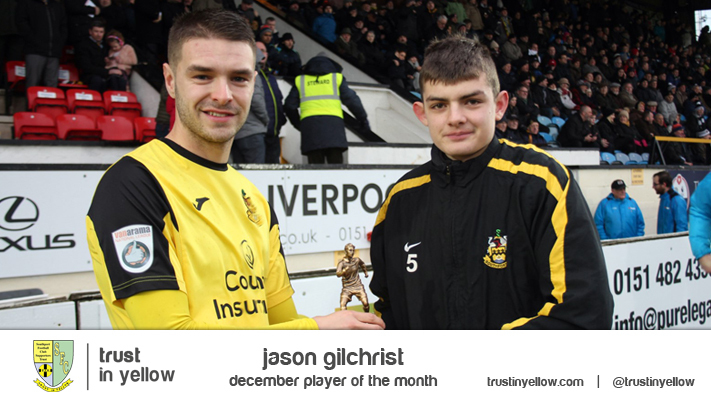 The August Player of the Month award will be presented by a young supporter and as usual they will be given 6 months membership. It was suggested that the Trust could invest in a cheap phone to be used for coach bookings amongst other things and also could have a specific username on Portchat to be used for communication with supporters. Looking ahead to the Trust's 10th anniversary next year one idea was to have special t-shirts produced. The board were very grateful to Andy for organising the next match signs. The coach to the match at Cheltenham on Saturday is definitely running. It will be the first time Southport have travelled to Whaddon Road since September 1998 after Cheltenham were relegated from the Football League in May. The fare is £19 Trust members, £24 non-members and £14 juniors with a departure time of 9.30am. 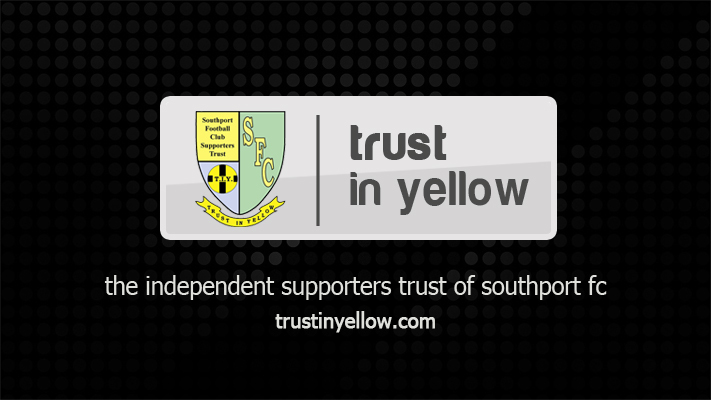 After a review of the Trust's coach travel during the summer, fares to all of Southport's away matches in August are lower than in previous seasons. This trip to Cheltenham represents excellent value as the fare to nearby Forest Green Rovers last season was £26 for Trust members. You can book your place by calling or texting Colin Aindow on 07861416859.
WHO IS YOUR PLAYER OF THE MONTH FOR FEBRUARY? SHAVE IT OR SAVE IT - TIME'S RUNNING OUT FOR DONATIONS!